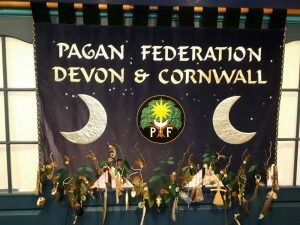 Every year Pagans from Devon, Cornwall & The Isles hold a Spring Conference and Ball. This year it was a sell-out event. This was my second time attending and I really enjoy hearing what the speakers have to say about their beliefs, ideas and philosophy. The Pagan Conference is an opportunity to gain a better, deeper understanding about a variety of things like magical symbols and Druid practices, worldwide Pagan history and culture. One may even be tempted by some retail therapy, with beautiful cloaks and works of art on offer. The speakers this year included Julian Vayne, Penny Billington, Marian Green and Suzanne Rance. Unfortunately, I missed Ronald Hutton. I found Julian and Penny particularly interesting and informative. I tried to make some notes, but there were so many ideas and stories that it was hard to keep up. Some of what I noted follows below. There are a variety of Pagan ritual activities taking place in modern society and no one is necessarily in charge of what people do in this context. One definition of Pagan could be that it’s less about faith and more about ritual doing. So that ‘cult’ acts, such as trees tied with ribbons are performed by people who may not see themselves as Pagans. Some people may perform a mix of ritual activities from different belief systems, including attending a Christian church. The term of abuse ‘Pagan’ may now be owned by those who do positive acts of engagement. Negative associations have at least diminished – so that people may feel free and are able to identify themselves as Pagans, including on hospital forms or census returns for example. They express themselves through doing ‘stuff’. It does seem however, that older people are more likely to be actively identifying themselves as Pagan. Sometimes ritual activities may seem onerous and a more enjoyable alternative could be reading fiction. We could consider if hard work necessarily equates with integrity in this context. Reading a book, finding some ‘me time’ can encourage us to be connected to the mysterious part of the universe. This is instead of just existing in our rather linear human world. Here where we may feel pressure to be buying more in order to become ‘enough’ and to loose sight of what is important to us. Performing a service to nature, clearing-up plastic from the countryside, or tending an orchard can bring our minds towards attention to the universe. Perhaps we should try to go to it, rather than expect it to come to us. I found myself thinking that positive and kind acts seem similar in any spiritual context or culture. It doesn’t seem difficult to distinguish these from the negative ones, which also take place in belief systems outside of Paganism. I often return to a spiritual narrative when I think of Cornwall. This sits alongside the factual historical context of exploring the landscape. Or perhaps it is better to say that the spiritual is entwined with the physical in Cornwall, Pagan and Christian, landscapes and built structures. 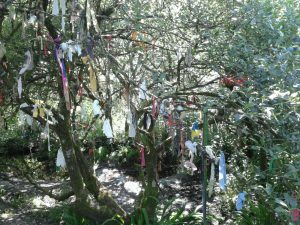 A pagan tour of Cornwall is very possible. A magical tour isn’t just about visiting the Boscastle Museum, although it’s a great place to start. I do usually carrying dowsing rods on the tours, but I’m not sure that this counts as magic. There are a lot of special places to visit and absorb. I like to keep an open mind and not to be afraid of the unexplained. 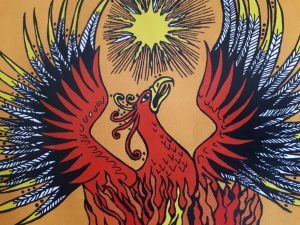 Next year’s conference will be run by Pagan Phoenix Southwest and is scheduled for Saturday 9th March 2019.